This article is about the raid. 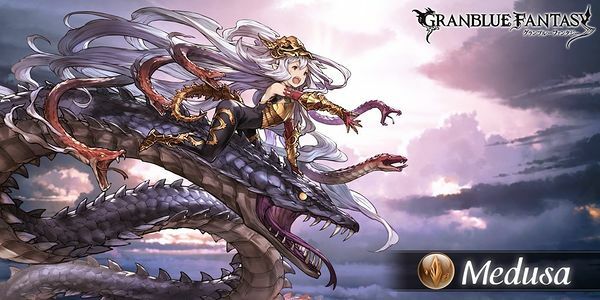 For the summon stone, see Medusa (Summon). For the recruitable character, see Medusa. Medusa is a raid in the Lumacie Archipelago at the eastern area, Nameless Ruins, Blackmoon Forest. If you own the Medusa summon, hosting and defeating Medusa unlocks the summon's blue star. これは蛇の試練よ！アタシたちが試してあげる This is the Trial of the Snake! We'll test you. さあ戦おののきなさい！かわいがってあげる！ Now, let the battlefield tremble! Let me show you just how nice I am! あたしの魔眼で石にしてわ！ By my demon eyes, turn to stone! 愚かな人間なんて、目じゃないんだから！ Foolish mortals, you're nothing! さあ戦きなさい！かわいがってあげる！ Now, tremble! I'll show you just how nice I am! 魔眼で射抜けば、すぐ石になっちゃうんだから！ If I pierce something with my demon eyes, it turns to stone immediately! 愚か者たちよ！アタシの魔眼で石にしてあげる！ You idiots! By my demon eyes, I'll turn you to stone! うっ…！あたしの魔眼を逃れた！？ Ugh... You escaped my demon eyes!? お前たちっ……泣いても許さない……！ Why, you... Crying won't save you! メドゥシアナのもたらす呪われし血が、お前たちに力を与えるわ The cursed blood of Medusiana will give you strength. This page was last modified on 25 March 2019, at 19:48.